ARRL is serving as a catalyst in a nascent campaign -- "Ivy + Amateur Radio" -- to boost college and university Amateur Radio club interest, membership, and activity. The initiative sprang from a conversation earlier this year between ARRL CEO Tom Gallagher, NY2RF, and retired Yale University staffer Dr Martin Ewing, AA6E, about how to get colleges and universities to revitalize their ham clubs. Ewing relayed the message to the president of the Yale University Amateur Radio Club (W1YU), who, in turn, contacted the president of the Harvard University Amateur Radio Club (W1AF). The two schools subsequently sponsored what turned out to be a standing-room-only forum at the 2016 ARRL New England Division Convention in Massachusetts over the September 10-11 weekend, with representatives from Harvard, Yale, Penn, and MIT on hand. "They all share common problems, which include finding suitable space, finding faculty or staff sponsors -- preferably permanent -- and providing for an orderly succession of student leadership," said Gallagher, who attended the forum and moderated the hour-long idea exchange that followed. Gallagher said a college club shouldn't fall into decline just because students graduate. "Undergraduates are busy people, they're all competing for the top jobs and have busy social lives," Gallagher allowed. "Sometimes it's difficult for Amateur Radio to compete with those other interests." 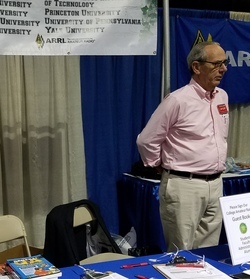 During the Convention and at the forum, ARRL gave copies of the 2016 ARRL Handbook to all college and university attendees. Representatives of the Ivy League clubs are planning to meet -- possibly in New York -- in December. "There's a lot of work to do before that next meeting," Gallagher said. "We want to create a reflector, we want to create a mailing list, we want to reach out to all the clubs that did not show up. And of course we welcome college clubs to join us." He said a senior member of the Yale team offered a "generous contribution" to ARRL to support the Ivy + Amateur Radio initiative. Initial efforts will include a newsletter and a Facebook page. Gallagher stressed that the outreach initiative is not limited to Ivy League schools, although that has been the initial focus. "We welcome the participation of everyone," Gallagher said, "but the Ivies and MIT stepped up in a leadership role. The Ivy schools are very competitive with each other, and college students are very competitive with each other, and what we want to do is to put that competitive energy to work to fashion wider college Amateur Radio club participation in the process." Gallagher noted that many state colleges and universities already have active Amateur Radio clubs. "We hope they'll join us in what will become an ever-widening circle," he said. Contact Tom Gallagher, NY2RF, for more information. Amateur Radio volunteers went on alert following an afternoon explosion on September 21 at a power station in Salinas that left some 1.5 million residents of the Commonwealth of Puerto Rico without power. ARRL Public Information Coordinator Angel Santana, WP3GW, said that as the evening wore on, the most sought-after items were ice and potable water -- which depend on electricity to power the pumps that deliver it. The outage also resulted in traffic jams due to non-functioning signal lights. The governor of Puerto Rico declared a State of Emergency. 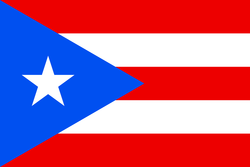 "On the Amateur Radio side, the VHF/UHF linked repeater system of the Federación de Radio Aficionados de Puerto Rico (FRA), an ARRL-affiliated club, was the main source of information," Santana told ARRL. "As soon as the situation began, lots of mobile and portable stations got on the air from east to west to report on the power loss, and ham radio was among the first to report the explosion, as smoke was observed soaring toward the sky." According to FEMA, the fire at the Salinas switching station caused the island-wide power generation plant to shut down as a safety precaution. FEMA said that all critical facilities operated on back-up generators, and airports, police stations, and water plants received priority as power was restored. The agency said telecommunications were operating normally. A NASA-provided view from space shows how much of Puerto Rico appears dark outside of San Juan during the power outage. Santana said designated repeaters on 2 meters and 70 centimeters that remained up and running served as the primary network for any emergency or health care traffic. On HF, Antonio Santiago, KP4IA, in Toa Alta was "the main source of what was happening even before the situation got to the mainland news services," checking into nets on 20, 40, and 75 meters and relaying information about the situation to other amateur stations on the mainland, Santana said. Santana said that two cellular phone companies had problems, and at least one death was reported, due to carbon monoxide poisoning from a generator. A few vehicle accidents also occurred, he said. Members of the Huntsville Amateur Radio Club (HARC) in Alabama had a role in getting help for a Louisiana cyclist injured in a September 17 group ride in Madison County, Alabama. A representative of the sponsoring Spring City Cycling Club told WHNT-19 News that a number of riders -- including Brian Guerrero, who was seriously injured -- fell as a motor vehicle was passing in the opposite direction. The cycling club spokesperson said it was unlikely the motorist caused or contributed to the accident. An investigation continues. The club praised the action of first responders and first aid from fellow cyclists -- a trauma surgeon and a nurse. The one-man "Cows Over the World" DXpedition has ended -- prematurely, abruptly, and on a sour note. Tom Callas, KC0W, reported that a theft this week in Kiribati has left him with nothing. He told The Daily DX that his Cows DXpedition is "permanently QRT." "Everything I own was stolen on 28 September from here in Kiribati," Callas posted on his QRZ.com page. "They took all the radios, computers, amplifiers, antennas, coax, everything. They even took my clothing and shoes. I have literally nothing left. I type this with tears in my eyes." The Cows Over the World DXpedition got under way last spring, when the Minnesota DXer fired up as KH8/KC0W from American Samoa. Other stops followed, and, after a brief hiatus, Callas last week announced plans to resume with his T30COW operation from Western Kiribati. He had been financing the round-robin DXpedition on his own. All call signs in the all-CW DXpedition tour included a "COW" suffix. In addition to T30COW, the "Cows" DXpedition has included operations such as 5W0COW, T2COW, and YJ0COW. Announced plans to operate from the Solomons, Tokelau, Bangladesh, and other locations now are off the table. 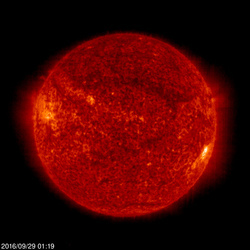 "Coping with the Solar Minimum" is the topic of the latest (September 22) episode of the "ARRL The Doctor is In" podcast. Listen...and learn! If you've never listened to a podcast before, download our beginner's guide. Just ahead on October 6: "Bits vs Baud." The National Park Service keeps expanding, which means there are more units to work for ARRL's National Parks on the Air (NPOTA) program. In August, Katahdin Woods and Waters National Monument was added. On September 23, Natural Bridge in Virginia became an official NPS Affiliated Area, creating the 489th NPOTA unit (AA26). It didn't take long for Activators to put the new unit on the air. Just 2 days after the designation, a group led by Todd Lee, N4USS, became the first to transmit from Natural Bridge. Bob Voss, N4CD, who was already in the area on one of his long NPOTA activation trips, was a close second on the same day. They even worked each other for a park-to-park contact. Look for this new unit to be on more in the coming weeks. There are 42 activations on tap for September 29-October 5, including the first-ever activation of the Statue of Liberty National Monument in New York, and the Little River Canyon National Preserve in Alabama. The official rules for the new ARRL 222 MHz and Up Contest have been released. The contest will debut in August 2017. Participants will attempt to work as many stations as possible on the 222 MHz through 241 GHz bands, "using any allowable mode." Competing stations will exchange six-character grid locators (sub-grids) at the time of each contact. Contact point values will be computed on the basis of both the center-to-center distance in kilometers between the sub-grid square of each station and an arbitrary "band factor," a multiplier ranging from 1 to 20. For example, contacts made on 222 MHz will have a band factor of 2, contacts on 432 MHz will have a band factor of 1, and contacts made on 24 GHz and higher will have a band factor of 20. To promote participation, the new contest encourages the formation of operator teams. These may be made up of Single Operator, Fixed; Multioperator, Fixed, and/or Rover category participants operating within a single Contest Region as defined in the contest rules. Participants may only be on one team, and the scores of all team members are combined. This is similar to the approach used for years in the NCJ-sponsored North American QSO Party (NAQP) events. Teams must register in advance of the contest with the ARRL Contest Branch Manager. The contribution of a Rover to a team score is limited to that portion of the Rover's score achieved from within the team's region. Team members' scores also count toward a club total in the Club Competition. The ARRL 222 MHz and Up Contest will kick off the weekend of August 5-6, 2017. Although ARRL believes it's important to maintain the long-standing tradition of the ARRL Outgoing QSL Service as a membership benefit, increased administration costs will require an increase in rates, in order to keep the Service available and viable. "The Service has been a member benefit for decades," an ARRL statement said. 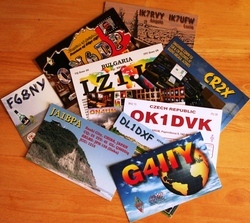 "Since its official formation in November 1976, tens of millions of QSL cards have been shipped from ARRL Headquarters to Amateur Radio QSL bureaus of other national societies worldwide. At one time, this benefit offered a safe, reliable, and inexpensive way to exchange QSL cards for a fraction of the cost of the postal service. What amateurs saved in financial cost, however, was made up for in time; it could take months, or even years, to send and receive a QSL through the bureau." Effective on November 1, the rate for 1 ounce of outgoing QSLs via the Service will increase to match the 1 ounce USPS international postage rate. As of September 2016, this rate is $1.15 per ounce -- about 10 cards. An additional service fee of $7 will be charged per individual transaction, to cover administrative costs. ARRL said QSLing is very different now, and, while postal services are generally more reliable than in years past, international shipping costs have risen significantly. "With the advent of the Internet and online QSL confirmation services such as ARRL's Logbook of The World, fewer and fewer paper cards are being exchanged," the ARRL statement observed. Calling the Outgoing QSL Service "a significant tradition in the world of Amateur Radio," the League said it's committed to keeping that tradition and service alive for members who enjoy using it. "We are committed to ensuring our members will be able to send their QSL cards through the Service for decades to come." The ARRL Foundation will begin accepting scholarship applications on October 1 from eligible radio amateurs planning to pursue post-secondary education in the 2017-2018 academic year. Completed applications must be received by January 31, 2017. Individuals and clubs support many of the more than 80 scholarships, ranging from $500 to $5,000, that are awarded annually. Applicants for all scholarships must be active radio amateurs and must complete and submit the online application. "The ARRL Foundation Board of Directors is very pleased to be entrusted with managing this program. The scholarship program is a wonderful way to encourage students to continue their Amateur Radio activities while assisting them with the costs of their higher education," says ARRL Foundation Secretary and ARRL Development Manager Lauren Clarke, KB1YDD. "All ARRL Foundation scholarships are made possible by individuals or clubs, and we are grateful for their support." The Foundation reported that 81 radio amateurs were the recipients of 2016-2017 academic year scholarships it administered. Awards totaled $120,150. Students planning to apply for 2017-18 academic year awards should first carefully review the eligibility requirements and scholarship descriptions. Although only one application per applicant is required, applicants may ask to be considered for as many of the scholarships for which they are eligible (some scholarships have geographic criteria or other requirements). Check off only the scholarships for which you would like to be considered. In addition to completing the online application, applicants must submit a PDF of their academic transcript from their most recently completed school year (e-mailed to foundation@arrl.org). Applications are due by January 31, 2017, by 11:59 PM ET. Applications without accompanying transcripts will not be considered. Award winners typically are notified in mid-May by USPS mail and e-mail. For more information about ARRL Foundation scholarships, e-mail the ARRL Foundation or call 860-594-0348. Earlier this year, following a challenge that resulted in the realignment of several club scores in the ARRL 10 Meter Contest, it became clear that the Club Competition rules were not being enforced as consistently as they should have been. In order to make sure club results are accurate and fair to all, the ARRL Contest Branch is renewing its effort to help clubs comply with the rules (See Section 8 of the "General Rules for All Contests"). It will no longer be necessary to mail, e-mail, or fax the club roster to the Contest Branch. Clubs now will be able to upload a club roster -- now called an "eligibility list" -- via a web page, just as they do with contest logs. Information will be time stamped and stored. The club just has to upload a file containing the current club roster, including the club's section or the center of the club's eligibility circle. All members' locations will be entered and displayed as six-character grid locators, such as FN21aw or DM02ks. It will no longer be necessary to determine latitude and longitude for members or a club circle center. The center of the locators will be used to calculate a member's distance from the club center using a standard algorithm that will also be public. A member may reside and operate anywhere in a six-digit locator that satisfies the distance rule. The maximum circle distances are not changing, however. With the availability of the online service, the deadline of 30 days following a contest to submit a roster is changing. Putting contests on the same footing as all other competitions, and to eliminate any temptation to pick only high scores or to engage in "category shopping," the eligibility deadline is being changed to the start of the contest, effective with the ARRL November CW Sweepstakes -- eg, 2100 UTC on November 5, 2016 -- and will apply to all nine ARRL contests that have a Club Competition category (see General Rule 8.1). Rosters and club circle centers can be changed and uploaded at any time -- via multiple uploads as needed -- until the contest starts. After a roster is submitted, it will be available for inspection online The roster eligibility service will allow other contesters to view the rosters and to make it easy for clubs to follow the rules. Challenges may be made through the Contest Branch. Minimum log totals for each club category will remain the same. A regularly updated list of Frequently Asked Questions (FAQs) has been posted. For more information, contact ARRL Contest Branch Manager Bart Jahnke, W9JJ. Read more. 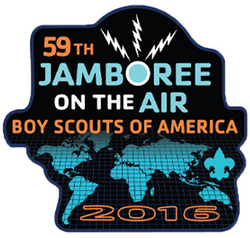 So far, 219 US stations have registered to take part in Scouting's 2016 Jamboree on the Air (JOTA), which will take place October 14-16. Registration remains open for the 59th annual event. Last year, 400 US stations signed up. JOTA officials are asking JOTA 2016 participants not only to register for this year's event, but to follow up with a post-JOTA report. "We expect to have several thousand stations around the world signed up by JOTA weekend," JOTA Coordinator Jim Wilson, K5ND, said in a JOTA-JOTI (Jamboree on the Internet) update. "Make sure you register your station." Designated Scouting frequencies are on the "Guidelines for Amateur Radio Operators" page. "Twenty meters is probably the go-to band during the daytime," Wilson said. "Try moving off the calling frequency and spreading out while making those contacts." Wilson noted that, in addition to the DX spotting websites, there's a Scout station spotting cluster. He also suggested taking advantage of "modes that don't require radio waves," including the dedicated D-STAR Scouting reflector 033A, as well as DMR, IRLP with topic channel 9091, and Echolink, with conference node JOTA-365. Doug Crompton, WA3DSP, and Elliott Liggett, W7QED, have set up Allstar node 41760 for JOTA/Scouting conversations, Wilson added. In addition to social media, ScoutLink is an excellent way to connect to Scouts around the world with only an Internet connection, he said. "Dave Edwards, KD2E, and Andy O'Brien, K3UK, have developed a Scout scheduling page," Wilson said. "You can use this to post your frequency and to pick up on other stations as well." More than 1 million Scouts in 150+ countries -- at nearly 18,000 stations -- are expected to take part in JOTA 2016, engaging with other Scouts to talk about Amateur Radio and their Scouting experiences. "JOTA is about conversations across town and around the world, rather than about contacts," Wilson said. cake decorated with images of local newspaper articles from 1908, the year she was born. The confection also bore an image of her 1933 "Amateur First" radio license, issued to Mary Sibyl Wallace -- her maiden name -- by the old Federal Radio Commission, when Cousins was 24. The FCC came into being the following year. Cousins' old call sign has since been reissued at least once. Cousins said she operated Morse, although she does not remember the code anymore, and used to relay weather information using that mode. Cousins, a native of nearby Stonington, Maine, worked as the town's librarian, a school bus driver, and a telephone operator. She said she never stops learning new things. The "Amateur First" Radio Operator License issued by the Federal Radio Commission in 1933 to Mary Sibyl Wallace. Cousins told Bangor TV station WFVX that in the 1930s, ham radio "was something that the girls did not do, and the boys were all doing it at the time, and I said, 'I can do it too.' And I did." Her cake also bore images of Stonington as it looked in 1908, when Teddy Roosevelt was the US president. Enlivening the party were 108 balloons and live piano music. Cousins received and read cards from many well-wishers. Her son John told WFVX, "When she decides she's going to do something, she's going to do it. I think 100 was going to be the goal. 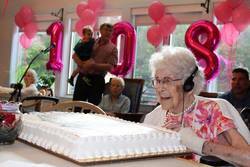 She wanted to reach 100. She did. And then she said, 'Well, might as well go for 105.' I think she's working on 110 now." Tad Cook, K7RA, Seattle, reports: Australia's Space Weather Services issued a geomagnetic warning, calling for variable geomagnetic conditions -- from active to major storms -- for the next 3 days. Average daily sunspot numbers and solar flux changed little for September 22-28 from the previous 7 days. Average daily sunspot numbers went from 29.7 to 29.9, and the average daily solar flux declined from 83.4 to 81.4. The average planetary A index was much higher, rising from 8.9 to 19.7. The average mid-latitude A index increased from 7.6 to 12.3. Projected solar flux for the near term is 85, 80, and 78 for September 29-October 1; 80 on October 2-3; 85 on October 4-7; 90 on October 8-14; 95 on October 15-18; 90 on October 19-21; 85 on October 22-27; 80 on October 28-31; 85 on November 1-3, and 90 on November 4-10. Predicted planetary A index is 44, 38, 30, 20, 14, 12, and 8 for September 29-October 5; 5 on October 6-14; 8, 10, 20, and 8 on October 15-18; 5 on October 19-22; 18 and 12 on October 23-24; 35 on October 25-27; 25, 20, 16, 10, and 8 on October 28-November 1, and 5 on November 2-10. Sunspot numbers for September 22 through 28 were 30, 49, 47, 18, 23, 21, and 20, with a mean of 29.7. The 10.7 centimeter flux was 85.1, 85.5, 84.9, 84.6, 86.8, 85.6, and 84.4, with a mean of 81.4. Estimated planetary A indices were 4, 4, 5, 23, 22, 38, and 42, with a mean of 19.7. Estimated mid-latitude A indices were 4, 3, 4, 12, 18, 21, and 24, with a mean of 12.3. ARRL to Host CHIRP Radio Programming Webinar: ARRL will host a CHIRP Radio Programming webinar on October 19 at 8 PM ET (0000 UTC on October 20 in US time zones). This presentation will offer a brief overview of the free, open-source CHIRP software, which can be used to program most radios. Attendees will learn: What CHIRP is, which radios are supported, how to get CHIRP, and how to troubleshoot CHIRP. Presenter James Lee, N1DDK, became active in CHIRP development for the initial TYT9800 driver. He is a hardware development engineer for Qualcomm. Register now! Those signing up will receive a confirmation e-mail containing information about joining the webinar. SEDCO Contributes $1,000 to ARRL Spectrum Defense Fund: The SouthEastern DX and Contesting Organization (SEDCO) has once again presented ARRL with a check for $1,000 at the recent W4DXCC convention it sponsors, to support the Spectrum Defense Fund. SEDCO has supported the Spectrum Defense Fund every year since 2009, except for 2012, when it gave $1,000 to the Second Century Campaign. With this check, SEDCO has given a total of $3,700 to support Spectrum Defense. The 12th W4DXCC convention took place September 23-24 in Pigeon Forge, Tennessee. Contributions to the Spectrum Defense Fund ensure that ARRL will have the resources to meet future challenges as they arise, and to protect Amateur Radio operating privileges.